Students, teachers and parents can view or access your online school schedule at any time, from any device — whether for exam registrations, school events, activities, appointments or managing class schedules. Choose calendar types. SuperSaaS offers three different online schedulers so that you can easily configure them to suit different uses or situations (e.g. group bookings, one-on-one appointments or for offering multiple resources). Use demos and resources. Easy to set up and use; try these demos for exam registration or booking a study adviser or booking classrooms/laptops/projectors, etc. Define user access. 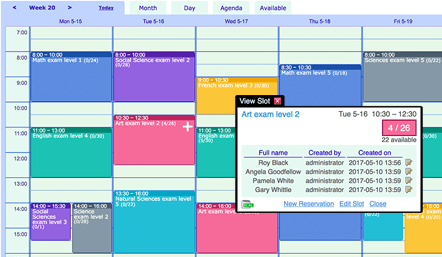 Save time by predefining how and when students, teachers or parents can make bookings. Users can also make repeat bookings in one easy step. Add payment processing. 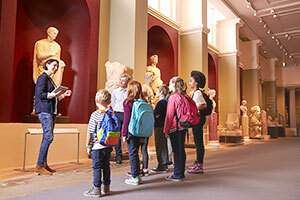 If you need to sell tickets for school events, you can add online payment collection during the booking process. Set up integrations. You can also link multiple schedules for teachers or sync with other calendars such as Outlook, Google Calendar, Office 365 or iCal. I run a computer lab for an urban school district. We used paper scheduling which was sometimes a hassle for teachers. Now, they easily schedule their lab time over the internet from the comfort of their classroom. It has made our job much easier. SuperSaaS is simply fantastic. I was able to set up my schedule quickly. We then published our web link in all our ads so all participants were able to schedule themselves. Because of SuperSaaS, we saved an enormous amount of time. SuperSaaS is very easy to use, takes little time to setup and edit and is very easy for users to access. It’s a time-saver and helps me in sharing scheduling information with my employees. It’s very customizable, and I like that I can upgrade and downgrade (or even cancel) my subscription as my needs change. The support is awesome and very quick and I have recommended to a number of other people. SuperSaaS is awesome software, it fits our needs perfectly. The variety of scheduling options works well for our organization. It is so easy to set up and our users appreciate the convenience.